I am so happy i did!! This slices through 350/400 GSM card without any effort. 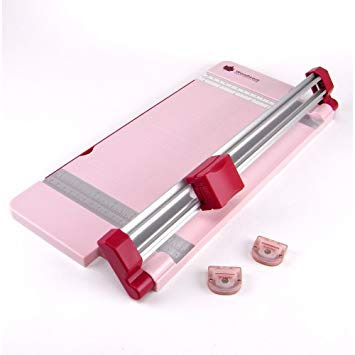 I have know doubt it will cut even thicker (Chipboard etc) If you are looking for a new paper cutter then this is my choice. My next favourite is this finger guard trimmer from Woodware. I have had this Trimmer for about 2 years and its my 'go to' Trimmer. I use it daily and i HIGHLY recommend it. I have nothing bad to say about this Trimmer whatsoever!! It cuts using a rotary blade so you get clean, crisp cuts every time. Another great thing about this Trimmer is the fact you can change the blades and give your cards some fancy edges! For example: you have a pinking blade, scallop blade, Victorian, scoring & perforated. There may even be 1 or 2 more. The blades just drop in and as its a safety trimmer, you have know fear of cutting yourself! The Trimmer has an extending arm which goes right up to 16" so you can even cut A3 card/paper! The blades rarely need changing but you also need to replace the grey cutting strip. They are inexpensive to purchase and you will get 4 uses out of 1 cutting strip. I would buy this Trimmer again and when this one needs replacing for whatever reason, i have know doubt at all that i will buy one again. 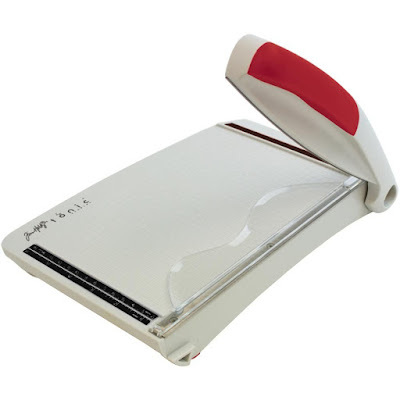 My 4th choice is this little Tim Holtz/Tonic Guillotine. Again, there is nothing bad to say about it. You get a perfect, clean crisp cut every time and this will also fit into your bag if you are going to craft class etc. 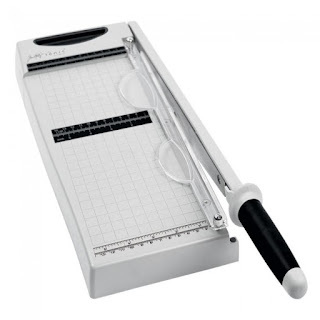 This trimmer is 6" wide so perfect for cutting your 6 x 6" papers. An ideal choice if you are looking for a smaller Guillotine. 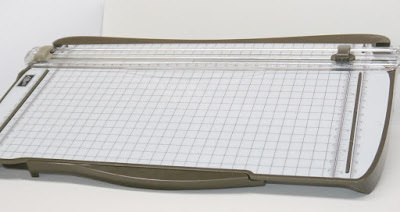 The last on my list is the Trimmer/scoring Tool from Stampin' Up. I have has this Trimmer about 3 years now and i purchased it while i was a Demonstrator for SU. This is my last choice purely because i am not happy with the cutting aspect. 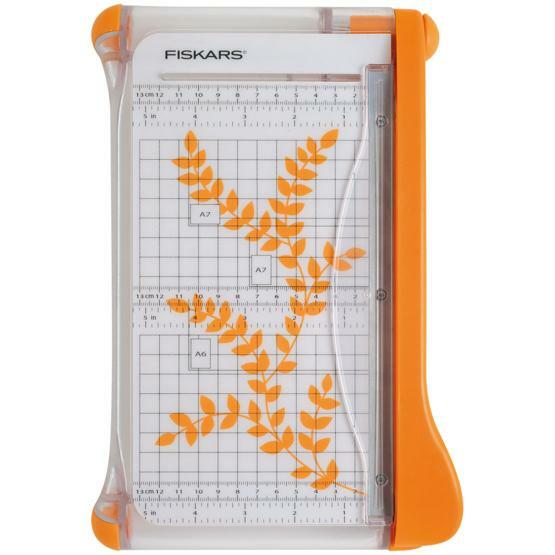 I never seem to get clean, crisp cuts and all i use this Trimmer for now is the scoring feature. You get a cutting blade and a scoring blade on the track so you don't have to keep changing them over to switch between scoring and cutting. This Trimmer also cuts 12 x 12" paper/card. It has an extending arm and also a safety feature where you can lock the cutting track to prevent little hands from getting in! I do like the scoring feature on this but i just feel like you are forever changing Blades and just never get the clean cut that you need for card stock. My honest opinion is that i would not purchase this again. So there we have it!! My honest opinion on the 5 Trimmers/Guillotines that i own. Please check out my YouTube video where you can see them all in action. I have placed the link at the end of this blog post. I was not 'sponsored' in anyway to do this review. Some of the links i provided may be 'Affiliate' links which just means i will earn a small commission if you purchase any of these Trimmers through my links. I will be back again very soon. 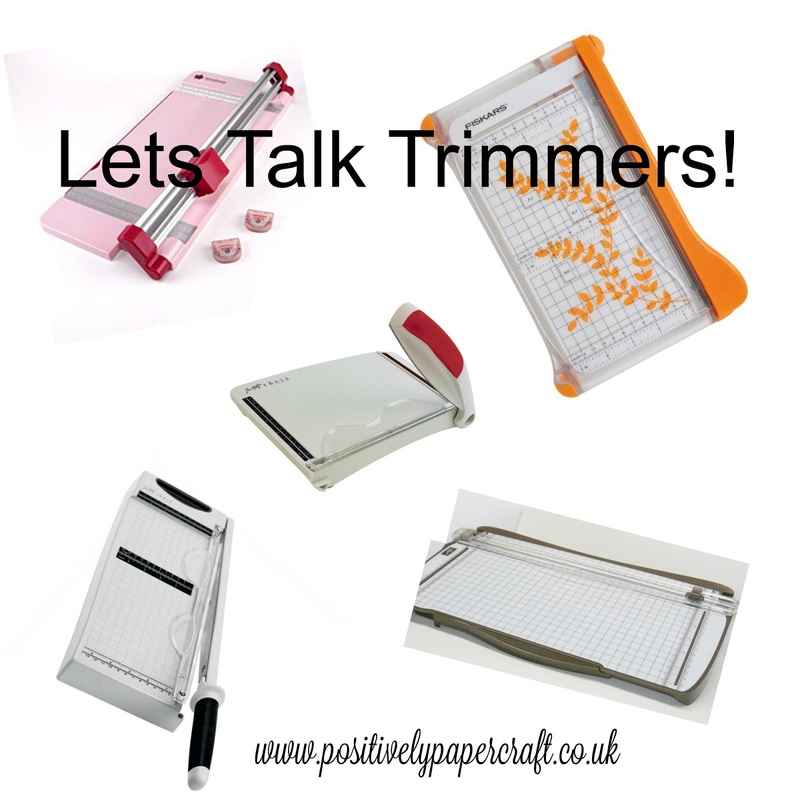 Hi Ann, many thanks for your thoughts and review on these, I have the small Discard and keep it on my work top as I craft, so handy and great little guillotine, highly recommend. Am interested in your Woodward trimmer had one of the early versions with changeable cartridges for all the different blades, another good trimmer. You say you've put links for each of the ones you've mentioned. Where do I find those links please?